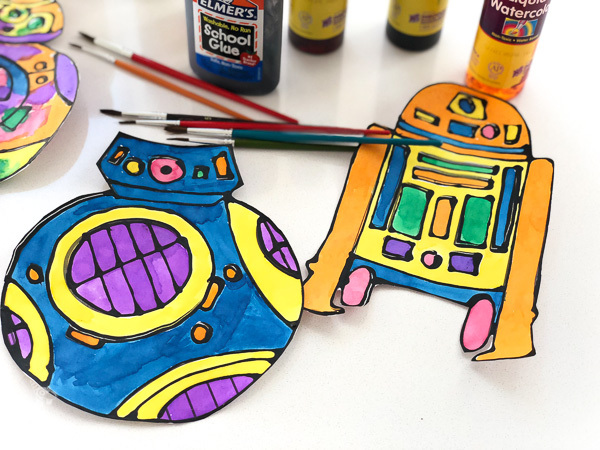 Inside: Learn how to create these fun droid Star Wars paper crafts so you have one more activity to share with the kids this summer. 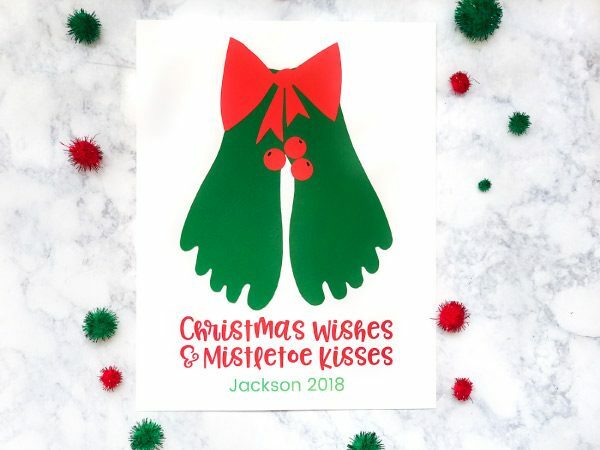 They’re the newest addition to the Star Wars printables collection. Today my son asked me exactly how old he needs to be before he can watch a Star Wars movie. It made me laugh because even though he’s never seen Star Wars, he still loves all things Star Wars. 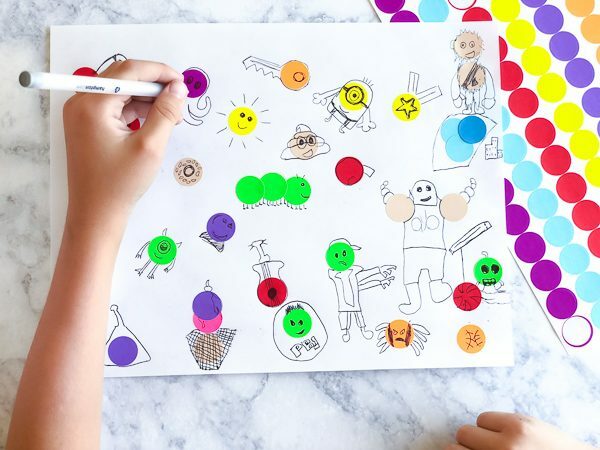 We’ve done several Star Wars activities in our house over the last few years including his Star Wars party, Star Wars I Spy, Star Wars coloring pages and Star Wars Lego mosaics. 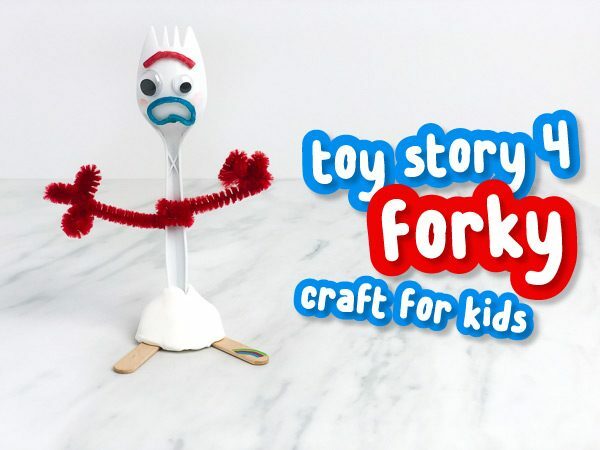 They’ve all been a huge hit, so I’m always on the lookout for new Star Wars craft ideas. It’s an art style that combines black glue and watercolors to create a bright and colorful finished project. Most of what I’ve seen was a little girly, so I created this Star Wars version to give my boys a try at this new trend. Read on below to learn how to create this art project at your home. To make this Star Wars paper craft you’ll need a few supplies. If you’re using a new bottle of glue, pour out approximately a 1/2″ worth of glue from the bottle. Use the black acrylic paint to pour about a 1/2″ worth into the glue bottle. Do this a little at a time to be sure you don’t thin out the glue too much (especially if your acrylic paint is thin and runny). Secure the lid back on and shake vigorously. Once you have it somewhat mixed, remove the lid and use the stir stick to mix the rest of the black acrylic paint into the glue. Continue until the entire bottle is black. 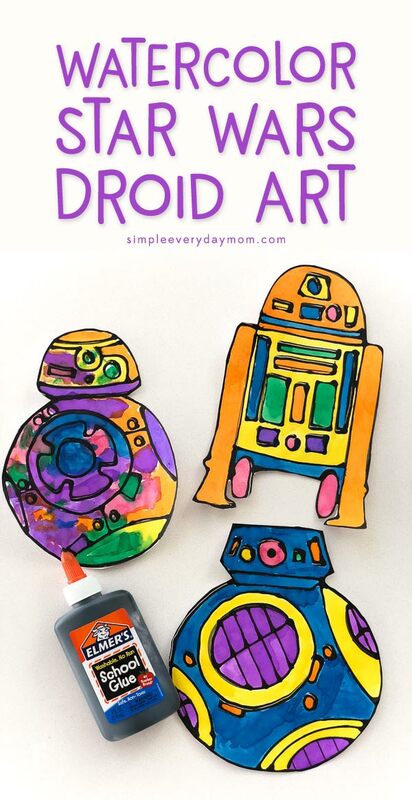 Print out the droid templates on watercolor or mixed media paper. (I didn’t have 8.5″x11″ watercolor paper so I cut mine down to size). Trace each of the droids with the black glue and let dry overnight. 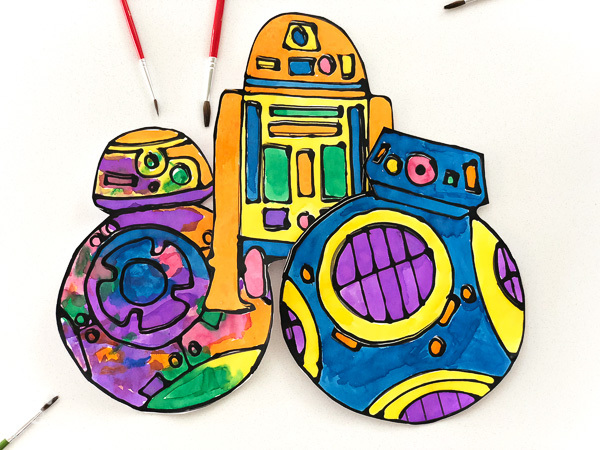 After the glue is dry, use the liquid watercolors to create your own colorful droids. 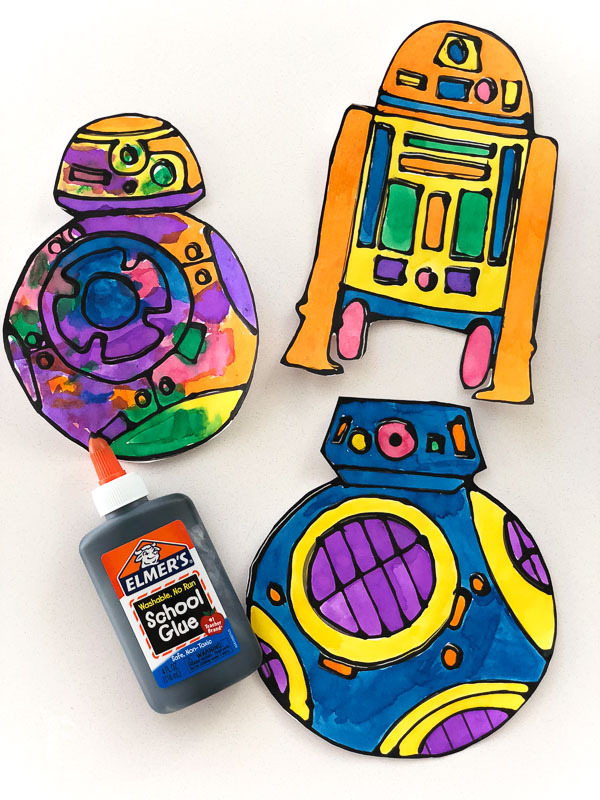 If your children are young and not proficient at using glue, trace the droid templates yourself the day before. My older son can use glue bottles, but I still traced the template for him the day before so he wouldn’t have to wait to paint them. Mix the acrylic paint in a little at a time to avoid making the glue too runny. I did ours all at once and it thinned out the glue too much for my preference. One problem we ran into was using paper that wasn’t thick enough to hold the glue and watercolors without warping. To avoid this, I would suggest using watercolor paper instead of whatever else you might have on hand. 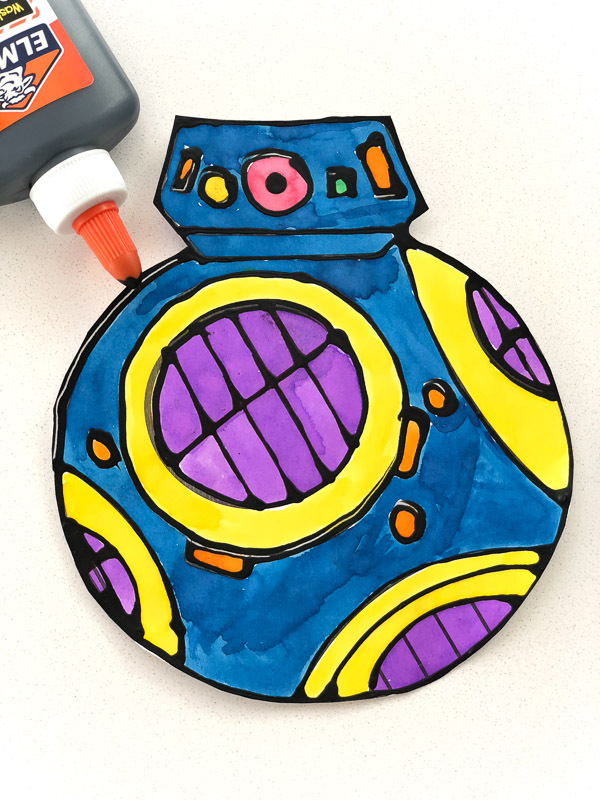 All in all, my boys thought this was an awesome Star Wars craft idea and I’ll bet yours will too! Enter your email address to download your free droid templates. That wasn't so hard, right? Now go check your email for your super fun download! Oh my goodness! I’m TOTALLY doing this tomorrow with my kids for STAR WARS day! 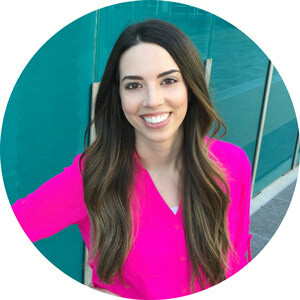 You’re super awesome! THANK YOU!!! Oohhhh, yay! Another idea for Star Wars Day. Which reminds me, I need to get all my stuff together for tomorrow too! Thank you! I can’t wait to try this with my boys in the school holidays!! They look great! !